This is the movie that spawned the 11-year CBS series. Set in the Korean War in 1950, M*A*S*H is a mobile army surgical hospital unit, otherwise known by the first initials of each of the words put together to form the word "mash". 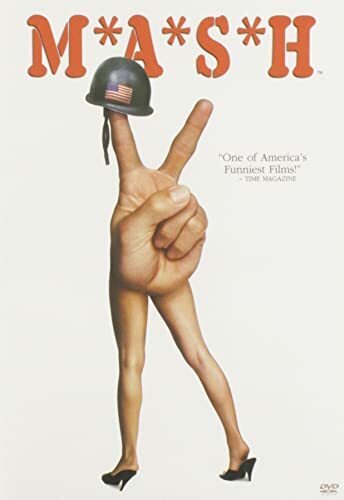 The 1970 Robert Altman film was a caustic comment on the Vietnam War, an unpopular war with the people in the United States. This counterculture movie exploded into the mainstream at the end of the '60s. Director Robert Altman worked for years in television and feature work when he struck gold with this landmark film that helped make his name in the film business, and that led him to create other offbeat works. Altman's style of cruel humor, overlapping dialogue, and densely textured visuals brought the material to life in an all-new kind of war movie that basically served for the purposes of being an anti-war film. This oddball movie painted a demented picture of vaudeville routines played against spurting blood, practical jokes being played while incoming wounded arrive via helicopter. The cast is led by Elliott Gould and Donald Sutherland, as the outrageous surgeons Hawkeye Pierce and Trapper John McIntyre, with Robert Duvall as the uptight Major Burns and Sally Kellerman in an Oscar-nominated role as nurse "Hot Lips" Houlihan. Of the film's cast, only Gary Burghoff repeated his role on the TV series version as the slightly clairvoyant Radar O'Reilly. Among the TV stars that took on the movie roles, Loretta Swit bore the closest resemblance to any of the movie actors: Sally Kellerman. The other roles in the TV series also went to TV actors, many of whom were already famous on previous TV shows before the series began its run in 1972.